Charles-Gilbert, Viscount Morel de Vinde (according to inscription on back of mount); Samuel Woodburn; Sir Thomas Lawrence (Lugt 2445); Samuel Woodburn; Lord Francis Egerton, 1st Earl of Ellesmere (Lugt 2710b), and by descent (sale, Sotheby's, London, 11 July 1972, no. 75); P. & D. Colnaghi & Co., Ltd., for NGA, purchase in 1972. The Lawrence Gallery, Sixth Exhibition, Messrs. Woodburn's Gallery, London, 1936, no. 67. 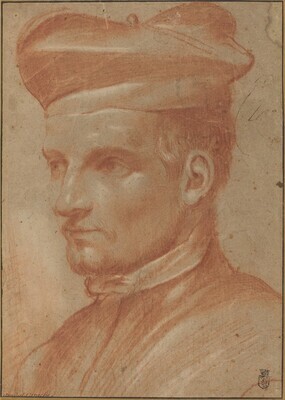 Old Master Drawings, Leicester Museums and Art Gallery, 1952, no. 16. The Ellesmere Collection of Old Master Drawings, Museums and Art Gallery, Leicester, 1954, no. 84 (P. A. Tomory). The Carracci, Drawings and Paintings, The Hatton Gallery, Newcastle upon Tyne, 1961, no. 166 (as Follower of Annibale). NGA Recent Acquisitions 1974, no. 28.